Has the Stock Market Ever Been This Expensive? If you’re afraid of heights, then don’t look down. 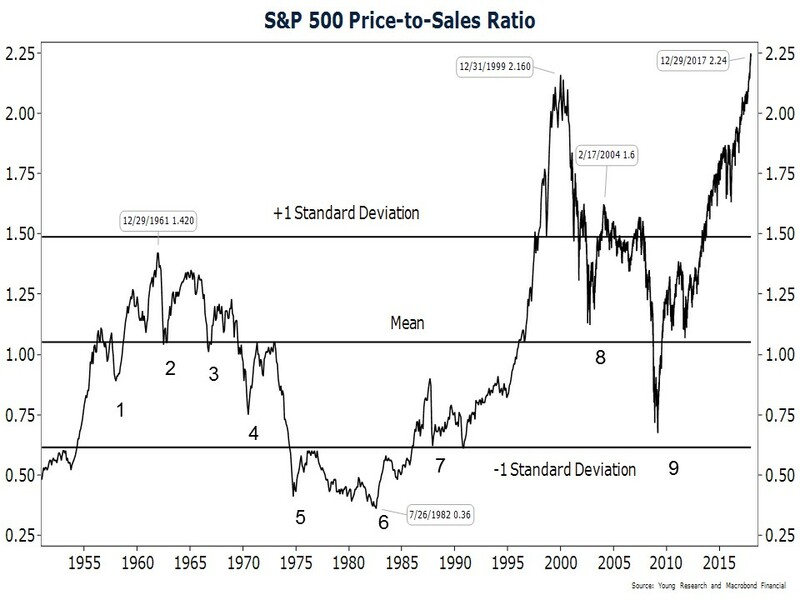 The current median price / sales ratio on large cap stocks will make your palms sweaty and your mouth dry. At 2.5x revenue we are at incredibly high levels. Back when the crisis was ending in the first quarter of 2009 and many people had unloaded their stocks at the lows, the price / sales ratio was at the low, low price of 0.80. It was a generational buying opportunity. What use price / sales? Conventional wisdom suggests that it’s harder to manipulate revenue than earnings so using a measure of revenue to value the market provides a clearer picture of where we are at today. That’s simply not true. In my book, What’s Behind the Numbers?, I spend a chapter talking about many ways management teams can pull the wool over investors’ eyes and make revenues look a lot healthier than they really are. This late in the stock market cycle, there’s much more incentive to goose the numbers because management’s wealth is increasingly tied to higher stock prices. But, even if we assume that the revenues reported by large cap companies is true and sustainable, we are at nosebleed levels. You don’t need to be a math major to know that when an asset class is trading nearly three standard deviations higher than the norm that risk has increased dramatically. It doesn’t really ever happen. We are in uncharted territory. Not only are the valuations extreme, it’s the case across the market. When the Internet bubble popped, it was mostly technology stocks that took a beating. In the 2008 financial crisis, many stock rebounded faster and more sharply than the major indexes. This time around though, there’s nowhere to hide. Everything is priced to perfection. That doesn’t mean the stock market is going to crash tomorrow. But, it does mean future returns are likely to be much lower. In fact, when the ratio is over 1.5x, the returns are just 2.5% annualized! It also means that in this game of hot potato you might be the one getting your fingers burned if you’re not starting to work some hedges into your portfolio.